This page provides details of plugins developed for the popular Corel AfterShot Pro (previously Bibble 5) RAW processor. CA Quest manages a "profile" of corrections which have to be applied differently for different cameras and lenses, and at different key settings. The Lens Correction feature for zoom lenses allows you to build a profile of the Chromatic Aberration correction required at each point in the lens' zoom range, interpolating estimated values for points in between. This is very useful if you do a lot of shooting with entry-level or "mid-range" zooms, which typically require significant, and varying, CA correction at each end of the zoom range, but relatively little in the middle. It also works well for compact cameras with zoom lenses. CA Quest also supports Aperture-specific profiling and control of Vignette correction as well as the main CA values. 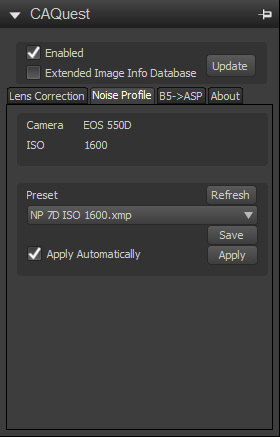 The Noise/Sharpening correction feature applies an appropriate preset to each image depending on the combination of camera and ISO value, allowing different noise suppression and sharpening levels by default at each point in the ISO range. Note that CA Quest doesn't implement any processing filter itself, it simply automates use of the standard correction functions (and those applied by some plugins). Usage is hopefully fairly self-explanatory. When you make an image active, the plugin reads the lens and focal length information, and looks them up in the correction database. If it can find either an exact match or sufficient information to propose a pair of CA values, it writes these into the "Suggested" line. If "Correct Automatically" is checked, or "Apply" is clicked manually, then ASP's CA function is enabled with the suggested values. 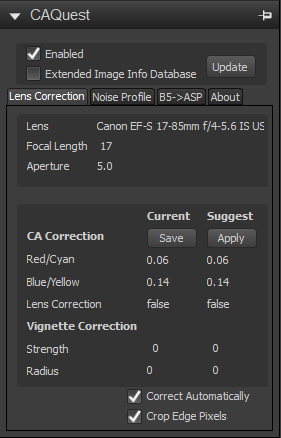 To build up your lens profile, simply manually adjust chromatic aberration in the ASP Detail tab (make sure CAQuest's "Correct Automatically" option is not set when doing this), and when you're happy with the correction, click "Save" in CA Quest. ASP's CA correction has an unfortunate side-effect that it currently puts a fine stripe of red or blue down one edge of the picture. CA Quest can also automatically correct for this. If "Crop Edge Pixels" is checked, then it will also set a very small crop on the image (typically about 4 pixels from each edge on an 18megapixel file). This won't override any existing crop, and you can disable the applied crop if you wish. Note that the logic for when these corrections are turned on and off follows the Bibble/ASP standard. CA Quest only turns on a certain correction when its value is different from the RAW default values, so the effect is equivalent to automatically enabling a feature when its sliders are moved. The "Reset" button resets CAQuest, and is useful if for any reason CAQuest has picked up incorrect data, e.g. because settings data has been cut and pasted between images. To use aperture matching, you have two options. Earlier versions of CA Quest used Phil Harvey's exiftool to build a database of images and their Aperture and ISO values. This is still supported if necessary, see here for details. However, under AfterShot Pro this is no longer required, and CA Quest now uses the ASP built-in support by default. Aperture matching is "fuzzy", so CA Quest will use a profile with an exact focal length and aperture match in preference, but will use data for a different aperture if no better match exists. Vignette correction is only turned on if a non-zero vignette strength is set. The upper panel shows the camera model and ISO for the current image. The lower panel provides a drop-down list of presets, which can be refreshed using the "Refresh" button. "Apply" applies the selected preset to the image, and "Save" saves that preset as the default to select for future images with the same camera/ISO combination. When a new image is loaded CAQuest will recall this assignment, and optionally apply the settings automatically. If you have not yet recorded a profile for the exact ISO value it will assign the closest match. Presets are created using ASP's standard preset tools. CAQuest can apply presets including any Bibble built-in settings, and also those for Spoilerhead's plugins such as Wavelet Sharpen and Denoise. It can be extended to other plugins but the developer will have to include a couple of lines of code in their plugins to share their group ID. 3. Updates any "andrewj" settings to match the new "CAQuest" plugin group name. Each of these steps is optional. Note that the backed-up and updated XMP files appear to be smaller than the B5 originals. This is because some whitespace is stripped out of the XML when the files are saved. However all the information is retained, B5/ASP open them without problems, and if you make any change then B5/ASP save the files in their standard format. Installation of CA Quest is straightforward. The only subtlety is that you need to run CA Quest once first to initialise some settings, then exit and restart ASP before CA Quest will be fully functional. It provides a message box to explain this on the first run. If you have an existing profile file (CAQuestData.xml) from Bibble then it can be used and extended with AfterShot. 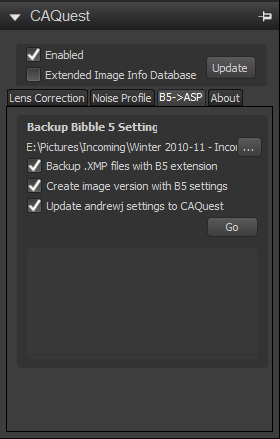 You just have to copy it from the Bibble user settings directory to the AfterShot one. However, when you copy it note that under Bibble it comes from the "home" settings directory, whereas for AfterShot it goes in the "PluginData" subdirectory. If this is working properly you will see the lens, focal length and aperture populated every time you make an image active. Basically if the lens and focal length are populated then all's OK, otherwise something is broken. If you're still using Bibble 5 then you can download V1.5.1 here: CAQuest.1.5.1.bzplug. This has a slightly different UI and doesn't support the ASP update features, but is fully functional for lens correction and noise profiling. If you like this plugin, then feel free to make a donation towards future developments. Is this plugin also effective with primes eg Canon 14mm L ? Yes, there should be no problem with primes. As they are fixed focal length the focal length will always be an exact match, and any aperture-sensitive settings will be handled well.